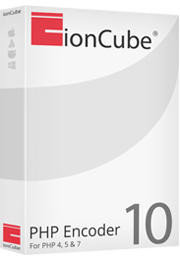 The ionCube PHP Encoder is available in 3 variants for Windows, OS X, Linux, and FreeBSD. The product prices are below. * The purchase of a main product license includes 3 months of Starter Helpdesk Support for FREE. Standard or Premium support may be purchased at any time before or after the free support has expired for enhanced support options. Minor product upgrades for the licensed product version are provided free of charge, with major upgrades available at a discount. ** The Windows and OS X Encoders come with a GUI. The Special Edition GUI is an upgrade adding support for automatic archiving of encoded projects, a simple FTP client for FTP transfer after encoding, and a unique and innovative concept called dynamic fields. Please see the GUI User Guide for more details.